The long awaited return to fishing, after 3 years out due to ill health, found Ray Mead (aka TUSKER) in a swim on the banks of the Belfry, with his mate Andy. The pair were soon wetting their lines, and within 5 minutes Tusk was calling Andy to man the net as Tusker was reeling in the first of four fish on the day. 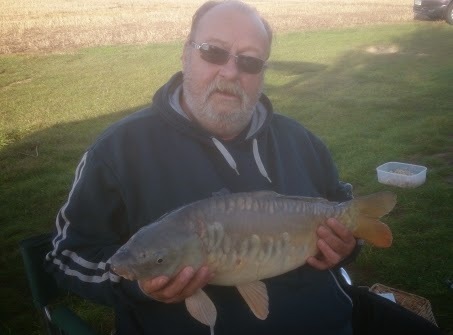 A Mirror Carp weighing in at 9lb 6oz caught on one of Andy's vanilla boilies over a PVA net of Robin Red mini pellets as recommended by Anglers Den. As the day progressed, Tusk went on to catch 3 more Common Carp weighing 5lb 4oz, 5lb 2oz, and 3lb 8oz. Tusk said Andy sulked most of the day, as he caught nothing but thoroughly enjoyed the venue and the day out.